WITH just two weeks remaining in the home and away season, the Victorian Football League (VFL) Women’s ladder is really beginning to take shape. 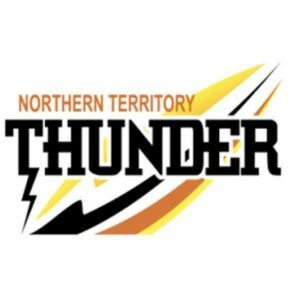 Following its huge win over Collingwood last week, the NT Thunder now sits in top spot (44 points) with just one game remaining on their schedule. Collingwood (42 points) and Hawthorn (40 points) sit right behind the Thunder and will be hoping that their game in hand can catapult them into top spot once all is said and done. Geelong sits comfortably in fourth position for now but a slight slip-up could see Darebin seize the opportunity and move to within half a game of the coveted spot. The Magpies look to bounce back from their first loss of the season this past week as they host the Saints in an important contest. Collingwood has made several changes, with the most important being the return of superstar, Chloe Molloy, who returns to the line-up after two weeks on the sidelines. AFLW captain, Steph Chiocci will miss the game after having played herself into some nice form following a return from injury. Despite the loss last week, Sophie Alexander was particularly impressive with 23 disposals as she continues to be a key part of the Magpies’ premiership quest. The Saints put together a very strong game against the Falcons last week, battling right to the end against an in-form Darebin side before losing by just four points. The duo of Eleanor Brown and Alison Drennan were superb and did everything they could to drag their side over the line. Finals are now officially out of the question for the Saints, however there is plenty to play for in order to build moving forward as well as individual success, with Tara Bohanna currently in the top five goal scorers of the competition. After an incredible two month stretch where the Bulldogs won six games in a row, they have now dropped two consecutive games and as a result find themselves officially out of finals contention. Another poor performance last week saw them suffer one of the biggest losses of the season in a lifeless 55-point loss against the Hawks. The Bulldogs were simply dominated in every category with the Hawks having almost 100 more possessions and well over twice the amount of inside 50s. A rebound performance across the board is certainly needed in order for the Bulldogs to finish the season on a high. Melbourne University comes into the game in some good form of its own, following a 53-point smashing of Casey. The win continues what has been a good month of footy, having won two matches over that stretch after a poor start to the season. It was stars aplenty last week as Madison Prespakis put together another huge game with 28 possessions in a best on ground performance. The forwards also dominated with Sophie Abbatangelo and Caitlin Greiser each kicking two goals. The Bombers host Williamstown in their first of two home games at Windy Hill to close out the season. Currently sitting in last place with just one win to date, the Bombers have two winnable games in the next two weeks to close their inaugural season on a high and move up the ladder. Hayley Bullas continues to be a shining light for the side, with an astounding 17 tackles last week to go along with 20 possessions in one of the best individual performances of the season. Jessica Trend has also put together a nice stretch of form and will be key for the Dons in the final two games of the season. The Seagulls come off an unbelievable comeback win against Richmond which saw them register just their second victory of the season. Down by as many as 20 points midway through the third quarter, Williamstown battled all the way back to steal a one-point victory. The second half performance should instill confidence into the side as it has a big opportunity to close the season out well. 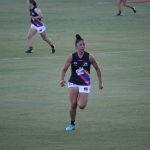 After weeks of reliance on Jess Duffin and Jenna Bruton, the role players for the Seagulls really stepped it up last week, particularly Jasmine Garner who was damaging with two goals and 21 possessions. 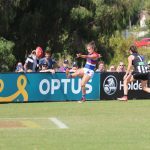 The Thunder recorded their sixth consecutive victory last week with a massive win over the previously undefeated Collingwood, which saw them move into first place with just two rounds remaining. The Thunder have the bye this week so this will be their home and away season finale and can also lock up a top two finish with a win. 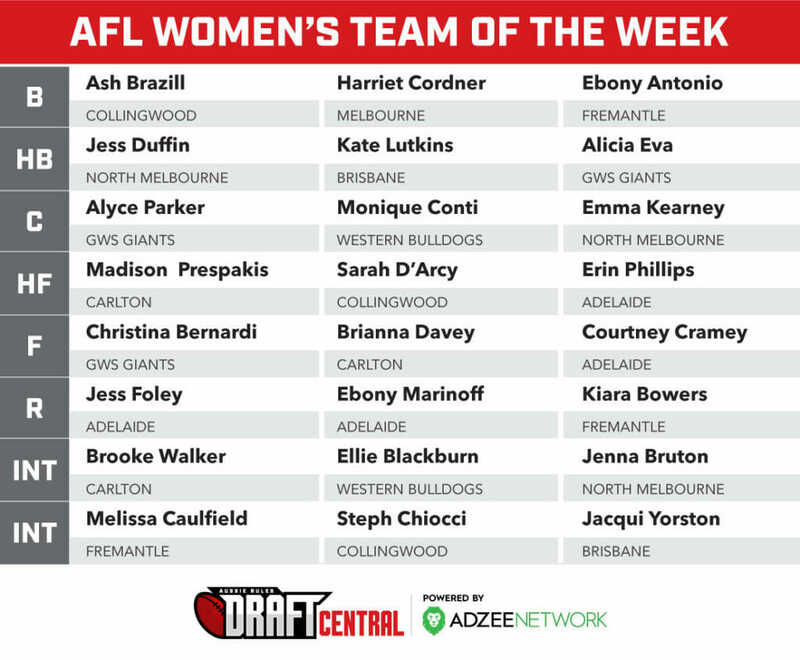 Angela Foley took the game away from Collingwood last week with 29 possessions and two goals and was complemented by Ebony Marinoff (28 possessions) and Jenna McCormick (31 possessions) also putting together strong games. For the Hawks, this game is critical in order for their top two push and a home final. A win pushes them into a tie with the Thunder, with an opportunity to surpass them in the final round into either first or second. A loss on the other hand could be very damaging, as they face Geelong in the final round and become in danger of falling to fourth come the end of the season. Sarah Perkins has been in terrific form recently, including her three-goal haul against the Bulldogs last week. She will be key in going toe-to-toe against the prolific offence of the Thunder down the other end. Another marquee game late in the season, which will shape the entire season once again. Darebin looks to keep its slim finals hopes alive when it takes on Carlton at home. Having won their last three games, the Falcons have put themselves in a position to contend for the final spot in the top four. Hannah Mouncey put together her best performance in some time, kicking two goals to go along with 16 possessions, however she will miss the game in what could be a costly out. Elise O’Dea does return to the line-up and should boost their midfield. Lauren Pearce also continues to be dominant in the ruck, winning plenty of centre clearances for the Falcons midfielders as well as getting plenty of the ball herself, tallying 21 possessions last week. Carlton come in fresh off the bye and is looking to continue its strong end to the season. The Blues sit in ninth position with just four wins thus far. However, the Blues have played some good footy over the past month, although results may not show it. Darcy Vescio has the opportunity to win the goal kicking title this week, currently sitting on 16 goals, needing three to surpass leader, Mouncey. Round 15 comes to an end when Casey hosts Geelong. The Demons will not take part in September action, however a win over Geelong could be potentially damaging to the Cats’ hopes of playing finals. The home side will be looking to bounce back from a disappointing performance against Melbourne Uni, losing by 53 points in a game they were favoured to win. Maddie Shevlin was a shining light for the Demons with 22 possessions and the team’s only goal. AFLW star, Bianca Jakobsson was also impressive. The Cats can secure their spot in the top four with a victory and potentially move up towards a top two finish if they win their final two games, given the tough competition the teams above them face. Geelong has made a habit of beating up on lower teams and Sunday should present them with another opportunity to do so. Danielle Orr and Mia-Rae Clifford were great last week with two goals each. Richelle Cranston was her usual self with 24 possessions as she continues to build on what has been an impressive season. COLLINGWOOD remains on top of the Victorian Football League (VFL) Women’s ladder without a loss, after scoring six straight goals and no behinds to defeat Melbourne Uni. NT Thunder and Hawthorn also recorded wins and remain in contention to take top spot, sitting comfortably in the top four. After nearly upsetting Collingwood at RAMS Arena last week, Carlton recorded an emphatic win over Richmond this week. The Blues opened up the game by kicking four first-quarter goals, and kept the Tigers goalless for the first half. 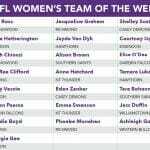 Captain, Kristi Harvey and AFLW forward, Darcy Vescio each kicked two goals on the day and were complemented by single goal kickers, Sarah Hosking, Georgia Fisher and Bailey Schultz. Hosking in particular played a wonderful game, adding 21 disposals, five marks and 10 tackles to her major. In terms of disposals, it was AFLW defender, Gabriella Pound who led the way with 27. 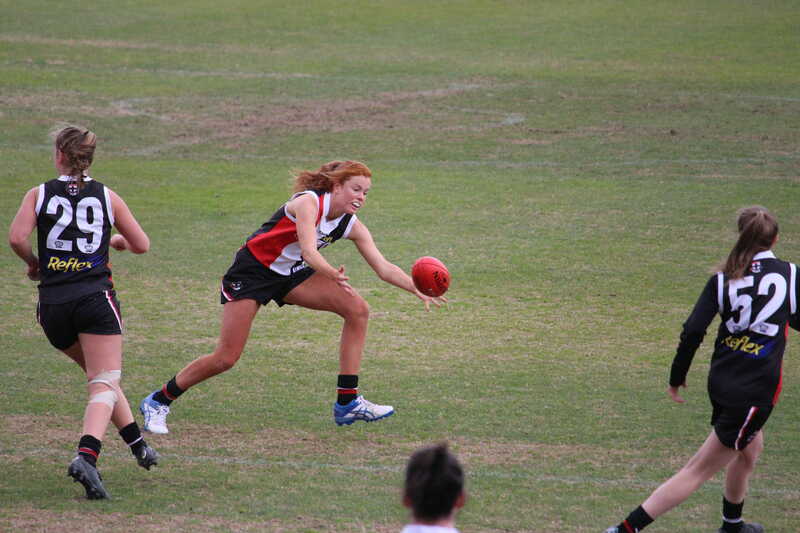 Katelyn Cox also touched the ball a lot, racking up 18 disposals, four marks and also laying five tackles. Richmond’s only goal came from star midfielder, Phoebe Monahan, who also led the way for her side in disposals. Monahan recorded 20 touches, took three marks and laid nine tackles. She was complemented by Jacqueline Graham, who also recorded 20 disposals as well as taking seven marks. Graham led the way for marks on the day, while Kate Dixon wasn’t far behind with five. After a tight tussle throughout the match, Hawthorn escaped with a nine-point win. At half-time, the Hawks had only scored seven behinds while the Saints had kicked three straight majors. Then after the main break, Hawthorn straightened up and got the upper hand, kicking 5.1 to the Saints’ 1.5. It was an even performance in terms of goals for the Hawks, with no multiple goal-kickers on the day. Instead, Rebecca Beeson, Emily Mcilvena, Sarah Perkins, Emily Gilder and Lou Wotton all kicked a major each. As usual, the experienced Jayde Van Dyk was as impressive as ever in defence, and earned best on ground honours from her coaches for her efforts in the back half. She was complemented by great games from Clare O’Donnell, Kim Ebb, Julia Crockett-Grills and Ebony Nixon. The Saints too also shared the goals around with Danielle Lawrence, Tara Bohanna, Kayla Ripari and Ashleigh Allsopp all getting majors on the board. Rhiannon Watt dominated in the ruck and was consequently named the Saints’ best player on the day. Samantha Johnson, AFLW Academy member, Courtney Jones, Leah Olsen and star midfielder, Alison Drennan also performed well on Saturday. With a 42-point lead at half-time, it looked like the Thunder was going to come away with a thumping win. But a late fightback from the Demons reduced the final margin to 12 points, after they kicked five goals to none in the second half. 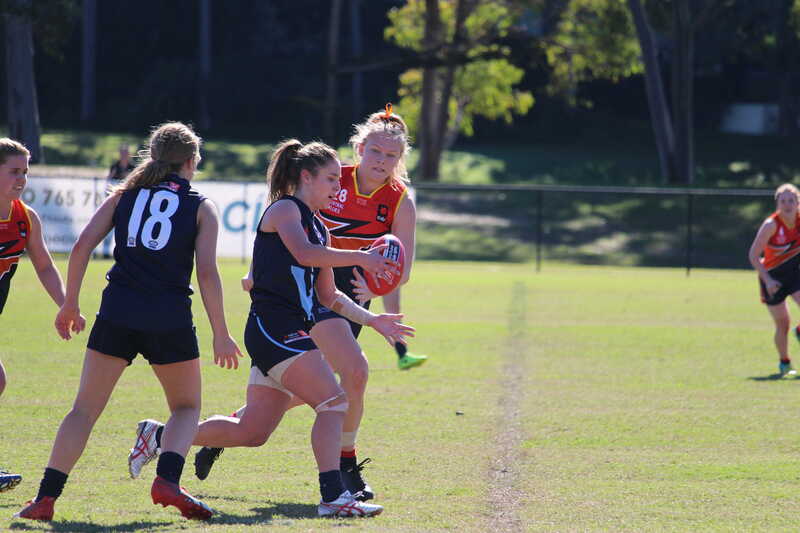 Jordann Hickey and South Australia Under 18 representative, Katelyn Rosenzweig led the way in goals, each kicking two majors for the Thunder on Saturday. Rosenzweig also led the way in marks, taking five for the day to go along with her 14 disposals. Fellow forwards, Jenna McCormick and Emma Swanson also had stunning performances on the day, despite not getting on the scoreboard. McCormick racked up 26 disposals, two marks and five tackles while Swanson touched the ball 24 times, took four marks and laid four tackles. 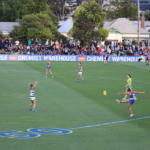 Casey also had two multiple goalkickers, with Melbourne AFLW duo, Eden Zanker and Shelley Scott each kicking two majors. Bianca Jakobsson was one of the most impressive Demons on the day, racking up 20 disposals and taking five marks. Katherine Smith wasn’t too far off, as she recorded 19 disposals, laid five tackles and kicked a goal. Kaila Bentvelzen also did well with almost identical stats, kicking a goal to go along with her 18 disposals and eight tackles. The Pies have made a name for themselves this season, sitting pretty at the top of the ladder, and this game was no different. Melbourne University set the tone early with plenty of forward 50 entries but was unable to capitalise on its scoring opportunities. The Mugars had some good glimpses of play but were unable to keep up with the relentless pressure of the Magpies who ended up coming away with a 17-point win. It took a while for the Magpies to get into the game but they showcased their dash across the ground and fierce intensity to win the footy. 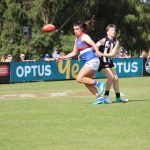 For the Pies, the likes of young gun Chloe Molloy impressed once again with her silky skills and ability to read the play, taking some strong intercept marks across the back half. In the midfield, stars such as Steph Chiocci and Brittany Bonnici took control, showcasing their footy smarts with clever kicks. Grace Buchan starred for the black and white with her quick release handballs to teammates and work around the stoppages. Sophie Alexander was also important for Collingwood, scoring two majors and looking ominous up forward. 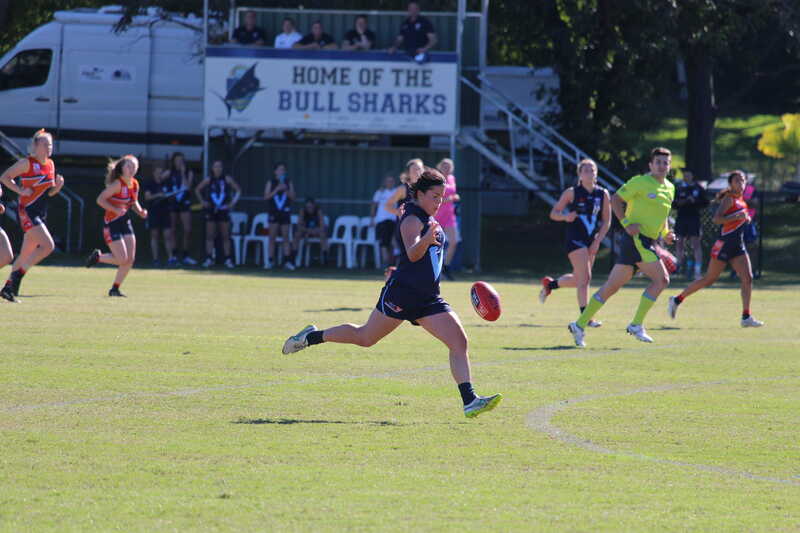 Melbourne University has plenty to look forward to, with the likes of youngsters Madison Prespakis and Caitlin Greiser showing great promise with their composure with ball in hand and ability to win the footy. Prespakis was in everything once again, imposing herself on the contest. Meanwhile, the likes of Emma Kearney and Kaitlyn Ashmore were impressive, showcasing their experience with ball in hand. Kearney starred with her dash across the ground and long penetrating kick into the forward 50.